AMOS serves in 22 rural communities and one urban clinic. Collectively we walk alongside 11,069 individuals. AMOS uses a community empowering model where each community commits to electing a health committee and a health promoter. They work with their local community to ensure basic health care and sanitation practices. The health promoter is trained in basic care of wounds and illnesses and with the health committee walk alongside community members to teach disease prevention and promote overall health. 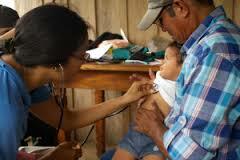 During the week they dispense a pharmacy in a clinic and make house calls, providing prenatal care and follow-up care. Health Committees and Promoters assist people with chronic diseases such as diabetes, hypertension, anemia. Anemic children if left untreated after age two can result in permanent damage to the brain. By screening and treating children for anemia we ensure that each child can grow to their full potential. Since 2010 1,121 water filters have been installed in 19 communities. As a result the dysentery rate has dropped dramatically resulting in fewer childhood deaths and healthier children spending more time in school. AMOS simply provides a community based health model, training and ongoing support. This model empowers communities to work collaboratively for the common good. AMOS also looks for ways to collaborate with the Nicaraguan government and NGO’s to maximize efforts to improve health care. I recently attended a board meeting and learned of efforts to respond to the Zika virus. Soon the rainy season will come and the mosquitoes will spread with the disease. AMOS is working with community leaders to educate people about this complex and devastating disease.